Photo credit Behzad Larry, Worldteach. Adapted by Transitions Abroad. Why volunteer abroad? There are countless reasons, ranging from very personal goals to intercultural, academic, and professional development growth opportunities to more global ones, including relational diplomacy, global citizenship, student activism, and civic engagement. The Association of American Colleges & Universities states that "Global service learning affords students opportunities to understand the larger structural forces underlying social problems, provides transformational learning experiences, and helps students see the world in a profoundly different way." And in a Gap Year National Alumni Survey, respondents cited these significant influences when deciding to take a Gap Year: gain life experiences and grow personally (92%), travel and experience other cultures (85%), and to volunteer (48%). There are countless volunteer programs, and it is wise to do your research. Things to look for include costs, locations, support, reputation, and culturally responsible opportunities. We’ve compiled our list of some of the top volunteer programs for 2019 — take a look! The costs of volunteer programs vary considerably. Some volunteer programs, such as the Peace Corps, offer a small stipend to cover living expenses for the two years of service. Some opportunities, such as WWOOF (World wide opportunities on organic farms) are no cost, self-directed, and offer a flexibility of movement — stay one day or stay a month or more, depending on your desires and the needs of the farm where you help. Volunteers for Peace offers meaningful, sustainable, community-led opportunities for $500 per project. Programs that are of shorter duration will, of course, be less expensive than longer programs, due to the time spent in-country. The more a volunteer program costs, the more likely it is to include a variety of opportunities, thoughtful and culturally-oriented programming, and in-country support. Global Vision International has a detailed summary of where the money goes in their organization — it pays for a support network, health and safety, food and accommodation, orientation and training, and more. It is important to frame volunteering as a foundational block for your life, both for your career and for your personal growth and development. By acquiring international experience, and by working, living, and being immersed in a different culture and language, you’re gaining marketable skills and knowledge for working in today’s global economy. Teaching in Namibia. Photo courtesy of Worldteach. These skills you’re gaining? You will be amazed at the life-long benefits of volunteering. One of the most important trends I see in volunteering is the valuable reach of the programs. This movement toward benefitting both communities and students in deep, meaningful ways is welcome, indeed. GVI’s Gwenin noted that students are looking for this aspect of the volunteer experience, as well, saying, “Experiential education, specifically volunteering, has great potential to positively impact both host communities and students.” As such, their programs (and those of many other organizations) work toward this goal. Volunteer in Honduras. Photo courtesy of United Planet. Several of the experts remarked that the trend of longer-term and gap year programming was important to many volunteers. Santulli shared that longer time frames for volunteer programs help to “create opportunities for people to come together in partnership and with a sense of mutual learning and humility. The longer time allows for participants to learn about a different culture/side of the world and creates opportunities for volunteers to contribute more meaningfully to locally-run and driven initiatives. In this way, by creating shared experiences over time, participants learn about local and global issues, broaden horizons, and share skills and perspectives.” He commented that volunteers weren’t only students, but also professionals who might be changing careers or transitioning in their lives. When you imagine volunteering abroad, what do you think of most? Yes, that — learning and working with people from another culture. When we open ourselves to the rich experiences that these unique opportunities offer, we do more than help others — we help ourselves…and the world. The whole process is transformational. Volunteering in the Dominican Republic. Photo courtesy of Global Leadership Adventures. Of course, a volunteer experience truly starts from the moment you start thinking about it and researching options until the time when you come home and share your experiences — and beyond. 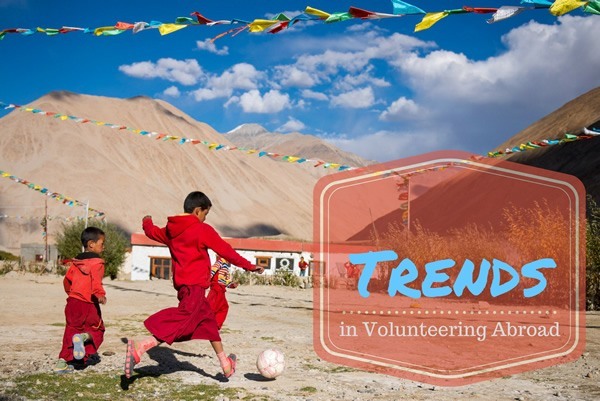 Many organizations are including re-entry as part of the volunteer experience, to broaden the definition of experiential education to encompass the entire experience, from initial excitement to reverse culture shock. Allen noted that it is imperative to include this, in order for students to be “able to process the change in your worldview.” Alumni events and social media give past participants an extended experience and connection with each other. Doyle Grossman concurred, sharing that Worldteach incorporates an end of service conference while volunteers are still in country as a reflection project that assesses intercultural effectiveness post-project. As well, they offer opportunities for alumni to mentor recently returned volunteers, as well as hold educational symposiums for alumni — the connection is never really over. In this internet age, it isn't only about telling stories when we get home, and sharing photos (or slides!) with friends and family. Now, the power of social media is harnessed to truly share these profound, intense global experiences in a variety of ways. The Peace Corps has three goals, the third of which is bringing the Peace Corps Volunteers' host countries to their readership, to promote peace and friendship. Many PCVs have websites, Facebook pages, Instagram accounts, and more. No longer is the foreign so foreign, in a way — by learning more about cultures around the world, travel becomes an adventure. Peace Corps Volunteer Abbie Olson is currently serving in Morocco, and her website is an example of cultural learning at its best. Every week, she shares much about her life in Morocco — and while I’ve had friends from Morocco, I’ve never learned as much about this country as I have from Abbie. Her Moroccan Monday articles directly address the Peace Corps’ third goal, by detailing life in Morocco and sharing cultural observations and teaching about interesting things there, such as the world's oldest university and library. The story of Abbie's very first day in Morocco gives us a glimpse into how she'll live over the next few years. She said, "As for me, when night began to envelop my first day of Peace Corps life, I was arguably a mess of emotions. With one day down, and indisputably hundreds to go, I was more than a little dazed. However, fully aware that no day is complete without a bottomless glass of mint tea and fifteen jolly Moroccans talking a mile a minute—and wrongly assuming that I could easily collapse into bed by 8 p.m. with a good book—I wasn’t entirely surprised when just minutes from attempting to retreat to my room, I was hauled in a rag-doll-like-fashion to my aunt’s house for a Mawlid dinner party. I have a theory that consistent caffeine throughout the day gives Moroccans incomprehensible superpowers." In The Art of Storytelling, Abbie writes, "For almost a thousand years, oral storytelling, or hikayat, was an essential part Moroccan culture; entire families would learn and pass on dozens of tales—many about heroes, lovers, cabbages, and kings—but recent technological advances have pushed the art toward a possible extinction." It is this very medium that shares and maintains storytelling — but perhaps in different ways than we expected — or can imagine. How will social media change the volunteer experience? Time will tell. But I think that social media, used wisely, can engage people in new ways, by showing that living and interacting with people from all over the world can enrich our lives in innumerable ways. iie.org offers a section on Non-Credit Work, Internships, and Volunteering Abroad that offers statistics about locations students choose to volunteer by year. LearningService.info is a website that explores issues relating to volunteering with a very critical eye, offers background videos, and a fine book on volunteering overseas by a team of experienced and accomplished writers who are experts in the field. Adventures Less Ordinary: How to Travel and Do Good is a free and inspiring ebook edited by Ethan Gelber. Experts, thought-leaders, and independent thinkers on volunteering abroad discuss responsible and creative ways to make a difference in the lives of those in need worldwide. To find the volunteer project appropriate for you, check out Transitions Abroad's extensive volunteer abroad section. Note that sites such as Idealist.org and VolunteerSouthAmerica.net also offer many NGO volunteer opportunities abroad. Dr. Jessie Voigts is the publisher of Wandering Educators, a travel library for people curious about the world, a travel site for her favorite place in the world. She’s published six books about travel and intercultural learning, with more on the way. You can usually find her family by water—anywhere in the world.